The Exposures catalog helps you celebrate life's most special memories with everything you need to preserve every one-of-a-kind moment, from photo albums and scrapbooks to photo frames, gifts and more. Enter promotion code - PZ15Off - at checkout on the Exposures website. 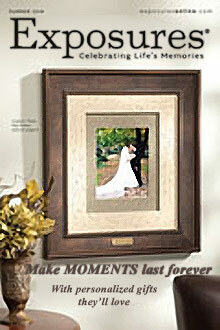 Exposures catalog - From 1st birthdays to 50th wedding anniversaries, the Exposures catalog will ensure that you are able to relive and cherish your most precious moments today, tomorrow and in days to come with a professional selection of photo products that will help you protect, store and display your most treasured photographs. You'll find photo albums scrapbooks, photo album refills, frames, storage boxes and photo gifts for all occasions and recipients. Photo albums and scrapbooks - Discover Exposures catalog's exquisite, genuine leather photo albums and scrapbooks that are expertly handcrafted and collected from all over the world. Featuring archival quality acid-free pages to hold on to your memories forever and a day, you'll find classic 3 ring photo albums, extra capacity or oversized 4 ring photo albums, 12x12 scrapbooks, specialty albums and photo album refills to protect you from running out of space. Exposures also helps you select the right type of photo album for your needs, so your photos will always enjoy the perfect fit. Photo storage - Keep your photos safe until they're ready to be archived in your family photo albums and scrapbooks with decorative photo storage boxes, files and furniture pieces that are a convenient way to organize and protect your photos and important mementos. Protect your cherished keepsakes from decay, sunlight, dust, humidity and other contaminants with acid-free photo storage boxes that are ideal for delicate photographs as well as newspaper and magazine clippings, children's' art projects, CDs, greeting cards and other prized memorabilia. Photo gifts - Whether you're shopping for Mom, Dad, the Bride and Groom or a brand new baby, the Exposures catalog will bring you a memorable collection of photo gifts for any occasions including jewelry and novelties that will surely be treasured by everyone on your gift list. From photo albums and scrapbooks to preserve memories to photo jewelry charms, jewelry boxes, bags, ornaments and a collection of fine frames to display and share your remembrances with all, you'll find a warm offering to commemorate any special day. Shop the Exposures Catalog for photo albums and scrapbooks that will be passed down from generation to generation as well as photo album refill pages, acid free photo storage boxes, unique gifts and other photo products that will provide you with everything you need to make your memories last a lifetime.